Coffee table is not only the need of living room only, if your outdoor spaces like garden and patio are equally functional then your would be surely in need of a coffee table to enjoy and accomplished sating there. You don’t need to go market for this purpose as you can a have a gorgeously trimmed coffee table at home to enjoy, coffee, drinks and the serving of more yummy items while enjoying a weekend with your family in the outdoors. 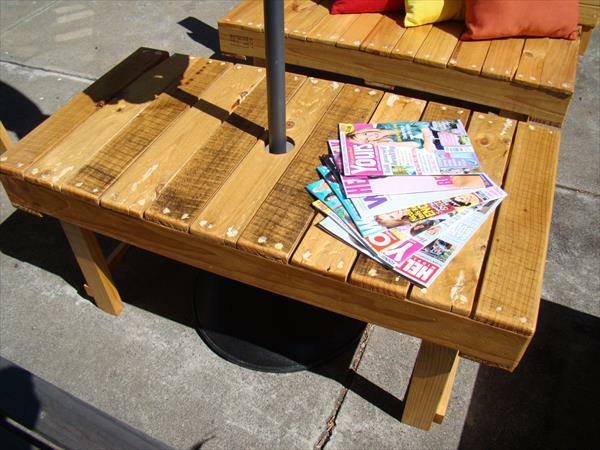 So here is a beautiful idea with our DIY pallets furniture + coffee table to bring some natural , durable and yet cheap pallets furniture for a complete look and full fledged look of your seating plans. The table has a very spacious table top, with a plenty of storage space under to give you some extra benefit. A parasol has been fitted in the middle of the table for a shady and more comfortable seating in the garden to avoid the scorching sun. 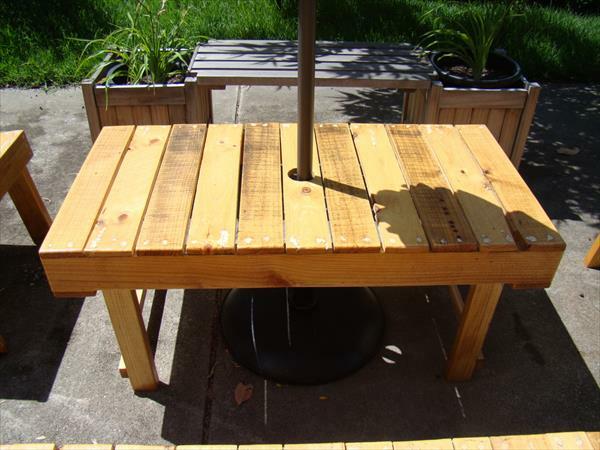 it has been finished with a layer of polyurethane for a luster natural woody look.